The big news today is that Salesforce.com has agreed to acquire Heroku, a company which hosts Ruby applications using an architecture that enables seamless scalability. 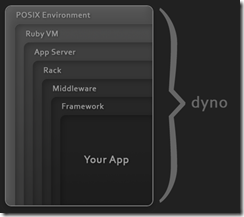 Heroku apps run on “dynos”, each of which is a single process running Ruby code on the Heroku “grid” – an abstraction which runs on instances of Amazon EC2 virtual machines. 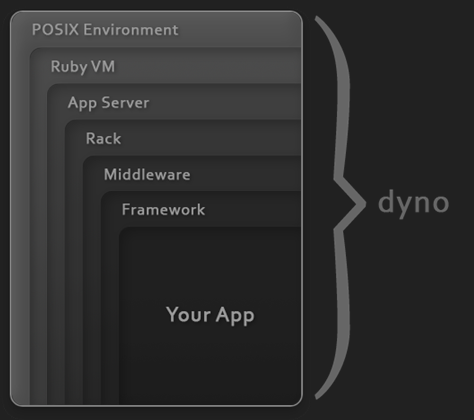 To scale your app, you simply add more dynos. Why is Salesforce.com acquiring Heroku? Well, for some years an interesting question about Salesforce.com has been how it can escape its cloud CRM niche. The obvious approach is to add further applications, which it has done to some extent with FinancialForce, but it seems the strategy now is to become a platform for custom business applications. We already knew about VMForce, a partnership with VMWare currently in beta that lets you host Java applications that are integrated with Force.com, but it is with the announcements here at Dreamforce that the pieces are falling into place. Database.com for data access and storage; now Heroku for Ruby applications. Appforce – in effect the old Force.com, build departmental apps with visual tools and declarative code. Siteforce – again an existing capability, build web sites on Force.com. ISVForce – build your own multi-tenant application and sign up customers. Salesforce.com is thoroughly corporate in its approach and its obvious competition is not so much Google AppEngine or Amazon EC2, but Microsoft Azure: too expensive for casual developers, but with strong Enterprise features. Identity management is key to this battle. Microsoft’s identity system is Active Directory, with federation between local and cloud directories enabling single sign-on. Salesforce.com has its own user directory and developing on its platform will push you towards using it. Today’s announcement makes sense of something that puzzled me: why we got a session on node.js at Monday’s Cloudstock event. It was a great session and I wrote it up here. Heroku has been experimenting with node.js support, with considerable success, and says it will introduce a new version next year. Finally, the Heroku acquisition is great news for Enterprise use of Ruby. Today many potential new developers will be looking at it with interest.